Flower delivery in Hancock and the surrounding communities of Houghton, Calumet, Dollar Bay, Chassell, South Range, Atlantic Mine, Trimountain, and Painesdale is available through Flowers by Sleeman. If you are looking for a centerpiece as a hostess gift or to adorn your family’s table for the holiday season or looking to brighten a friend’s day just because, our flower delivery service in Hancock and Houghton is equipped to meet your needs. Hancock flower delivery is available Monday through Friday from 9 a.m. to 5 p.m. and Saturday from 9 a.m. to 2 p.m. We deliver flowers in the Hancock and surrounding areas for any and every occasion. Send a welcoming bouquet to friends welcoming a new baby at UP Health Systems Portage or Aspirus Keweenaw or a cheerful arrangement to a friend recovering at home. 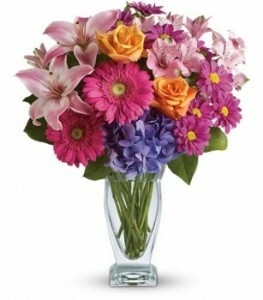 Flower delivery in Hancock with Flowers by Sleeman will not disappoint – delivering to your requested address right on time. Our flower delivery Hancock specialists will also work with you to find the right arrangement for area funerals, delivering directly to the funeral home prior to the service. We believe professionalism is the key to a flower delivery service and strive to provide that for the Hancock and Houghton region. When it comes to your wedding day, the last thing you want to worry about is the details of picking up and bringing flowers to your venues. With Flowers by Sleeman, our flower delivery service for the Hancock and Houghton area – ensuring your wedding day flowers are delivered with plenty of time to spare before your special day begins. Rest easy knowing Flowers by Sleeman will deliver your floral arrangements to your venue. We pride ourselves on delivering our flower arrangements throughout Hancock and Houghton in a timely manner, ensuring your friends and loved ones receive the attention they deserve on their birthdays, anniversaries, and every holiday in between. 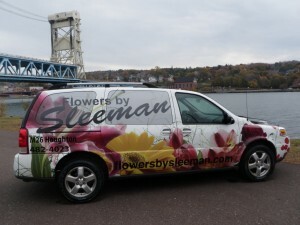 When it comes to flower delivery in Hancock and Houghton, you can count on Flowers by Sleeman to deliver in style.